Isabelle Lapierre of Levis, QC earned a commanding win in the Canadian Hunter Derby series at the Royal Horse Show in Toronto, ON to claim the National Championship title on Nov. 6, 2018. Riding Carrera S, an eight-year-old Holsteiner gelding sired by Corrado I and owned by Johannie Legare, Lapierre earned back-to-back wins against a stacked field of 20 of the nation’s top hunters. “To win is a dream, so maybe the best thing now is to retire from doing hunter derbies,” joked Lapierre, 39, a professional based out of Les Écuries de la Chaudiére who trains and competes high performance hunters and jumpers up to the international level, and made waves in 2017 after winning two FEI World Cup Qualifiers. Lapierre’s journey to the title started in the $15,000 Braeburn Farms Canadian Hunter Derby on Nov. 4. Following the traditional Hunter Derby scoring format, each entry received a base hunter score out of 100, plus up to 20 extra points through high performance and handy bonuses. High performance bonus marks were awarded at a rate of two points for each high performance option taken on the course – which included higher jumps and more challenging line options. Handy bonus points were given at the discretion of the judges, Kitty Barker of Middleburg, VA and Rob Bielefeld of Wellington, FL, for handiness displayed on course, such as unique approaches to jumps, and an impressionable start and/or finish to the course. The last in the field to take to the ring, the pressure was on Lapierre after the 2017 Champions, Erynn Ballard, 38, of Tottenham, ON and Enchanted, a seven-year-old Dutch Warmblood mare sired by Bustique and owned by Christel Weller, laid down an impressive score of 100, encompassing a base score of 87, a high performance bonus of four, and a handy score of nine. With Carrera S jumping in top form, Lapierre also took all of the high jump options and had a bold start, cantering straight to the first jump out of the in-gate. Her short, smooth turns and consistent pace sealed the deal, and the judges awarded her an impressive 113 out of a possible 120 points. This included a base score of 95, high performance bonus of eight, and a perfect 10 for the handy score. 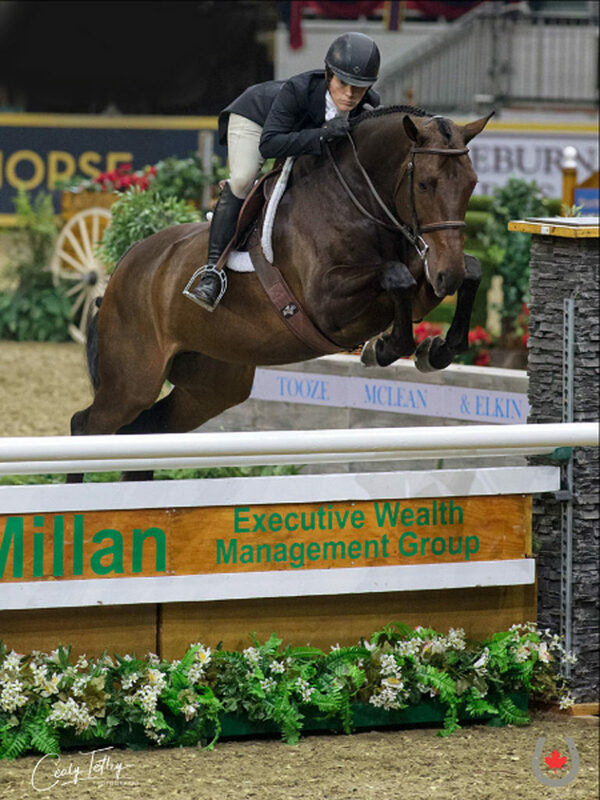 The Canadian Hunter Derby Series returned to the Coca-Cola Coliseum on Nov. 6 for the $25,000 Knightwood Hunter Derby. With entries competing in reverse order from the previous class, Lapierre was once again the last to compete. Ballard, who is fresh off her major games debut for the Canadian Show Jumping Team this past September at the 2018 FEI World Equestrian Games in North Carolina, once again laid down the gauntlet, piloting Enchanted to a base score of 90, handy score of seven, and earning the maximum 10 points for taking all of the high options for a total of 107. However, Ballard’s lead was short-lived, as Lapierre and Carrera S had another strong showing to win by a thin two-point margin after the judges awarded a base score of 93, handy score of eight and high performance bonus of eight for a total of 109. As the National Champion for 2018, Lapierre was presented with the Lorna Jean Guthrie Challenge Trophy. Several other awards presented by the EC Jumping Committee were given out following the Derby, with Lapierre and Carrera S also being recognized with the $10,000 Prince of Thieves Go West Trophy as the Eastern Division Champions of the Canadian Hunter Derby Series. Kassidy Keith, 20, of Nanaimo, BC was the recipient of the $10,000 Represent the West Championship as the Western Division Champion with Carivero, owned by Miranda Lebeuf. For more information on the Canadian Hunter Derby National Championship and a full list of results, visit www.royalfair.org.